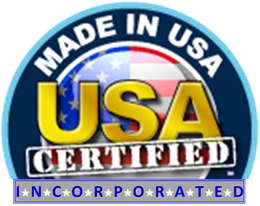 CLARENCE, N.Y. & BOCA RATON, Fla.–(BUSINESS WIRE)–Made in USA Certified, Inc.proudly announces that USA Flag Supplyhas successfully completed the Made in USA Certified proprietary audit process and is the first U.S. Flag Manufacturer in the United States to be granted license to the Made in USA Certified Seal. The guidelines utilized in the analysis of the product and its origins meet those of the U.S. Government and the Federal Trade Commission. The Made in USA Certified Seal assures consumers the ‘Made in USA’ claim is true and verifiable. USA Flag Supply firmly believes that every American Flag should be made using the finest U.S. sourced materials and handcrafted by citizens of the United States of America. At USA Flag Supply they feel strongly that as an American Flag retailer, they have the responsibility to sell only flags ‘Made in the USA’ and operate their entire business in the United States (including their customer service). USA Flag Supply is an online retailer of American Flags, Don’t Tread on Me Flags, Flag Kits, and Flag Hardware. Every single American Flag stocked is handcrafted in the United States. Visit online at www.usaflagsupply.com or contact customer service Monday through Friday, 8 a.m. to 5 p.m. EST at (877) 685-9260 to learn more. Made in USA Certified, Inc.